I don’t know about where you live, but here in Pennsylvania we’ve been having the dreaded summer 3 H’s – Hazy, Hot & Humid! So thankful to have central air!!! I haven’t been here for quite a few days, but be assured, I’ve been busy, busy, busy trying to get some projects completed to share with you!!! I have a tendency to start about five different things and go from one to another, back and forth , and not finishing anything! 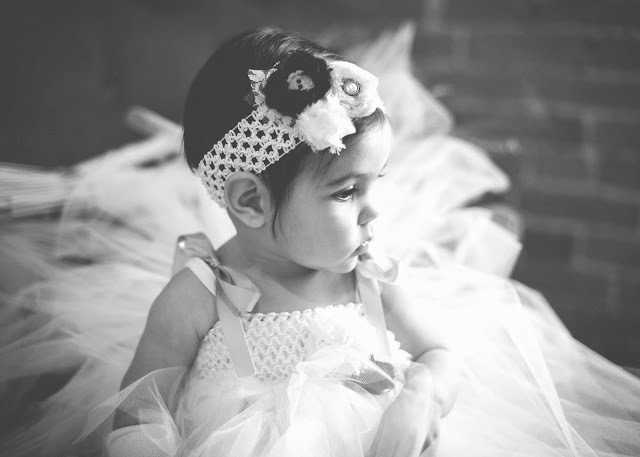 Yesterday, I decided I was going to start finishing projects one at a time – no more back and forth! Get focused girl!!! So, the first thing was to dress up my front door! 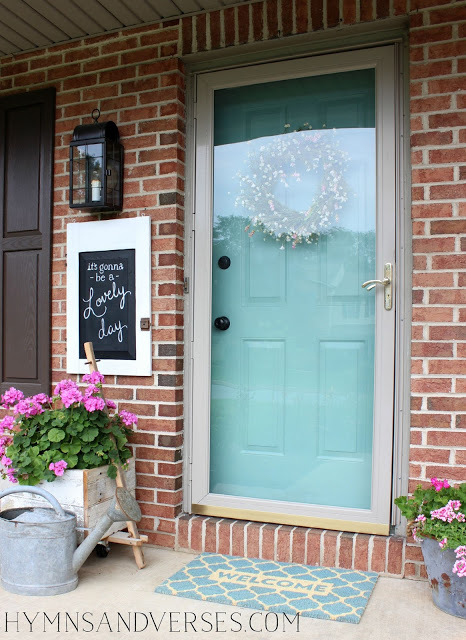 I get a lot of requests about my front door color – it is Benjamin Moore Mill Springs Blue. I painted it last spring and I still love it! Just a reminder – you can now find sources for my home under the “My Home” button in the navigation bar above! The cabinet door chalkboard is one of my favorite things to hang by the front door! I wrote a little lyric to a song that pops into my head in the morning some days! The wagon is the one we used for Josh and Sarah’s wedding to pull their sweet little flower girl down the aisle. 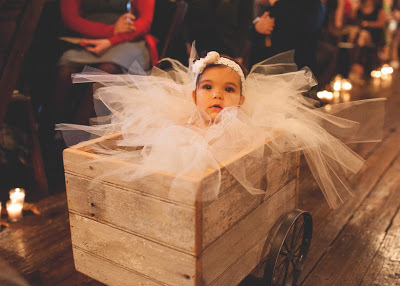 Her little tulle dress just billowed over the edge of that wagon! 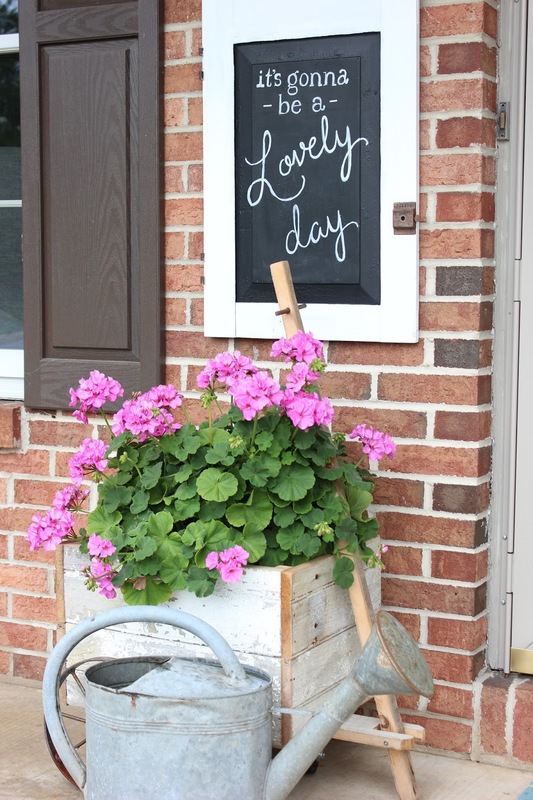 It was perfect that day – but just as perfect holding a huge container of pink geraniums! My antique watering can had been out back on my potting bench, but I decided it should get more attention and I moved it to the front porch! 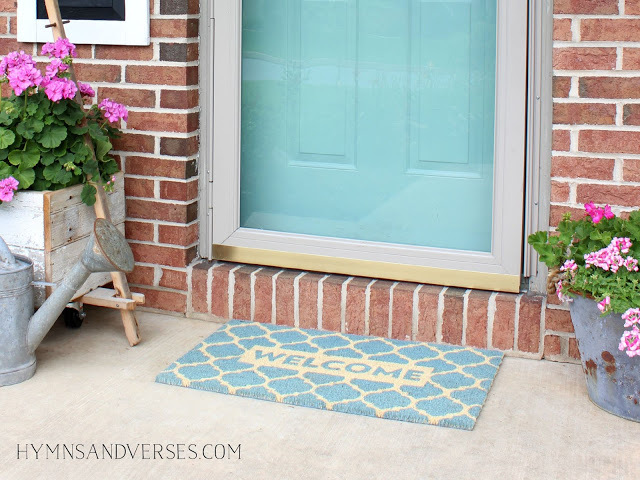 The pretty door mat is from Target – isn’t it cute and matches my door too! I wish it was a little bigger, but it won out on the cuteness factor! 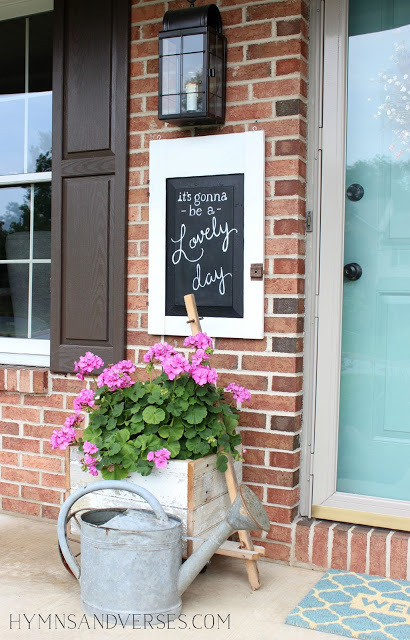 On the other side of the door is an oval tin container that I got last year at HomeGoods. It wasn’t rusty when I purchased it, but I used it last summer and also at Christmastime outside and it developed some rusty charm during that time! One last thing – I’ve been blogging for a little over 3 years now and I thought it was time to have real logo. So, here it is! I’d love to know what you think of it! I’ll be back soon with another finished project!!! I love your front porch and your logo is perfect! Great idea! Did you make the wagon? So cute! What a welcoming porch, Doreen! Your geraniums are especially beautiful. Can you tell me how you care for them? And what kind of light do they get? Keep cool! 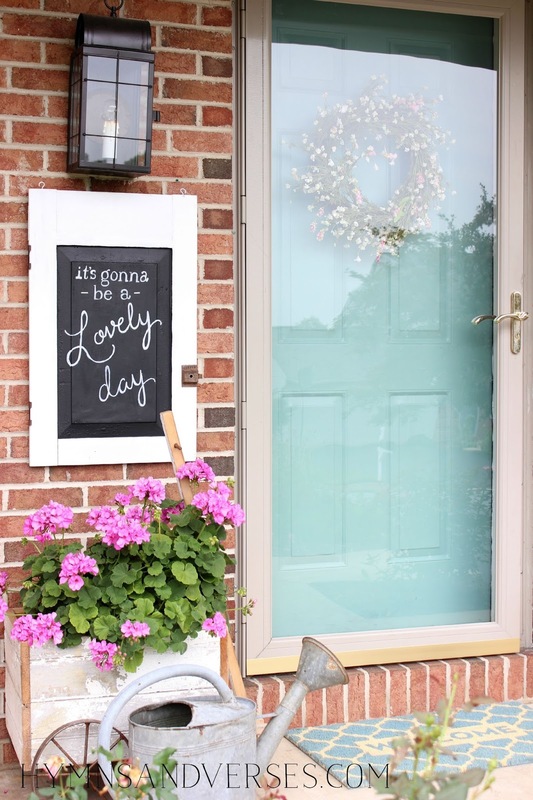 Your front entrance is adorable. We are getting ready to paint our exterior doors a charcoal gray. Then my next DIY will be a homemade wreath to go on the front. I'm thankful I found your blog! Nice work! I love everything about your front porch! And your logo is perfect! 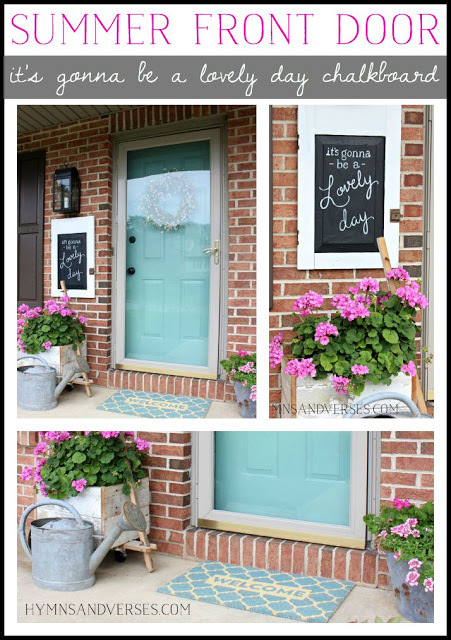 What paint did you use on the shutters? Spray or exterior and did you put a clear paint over?